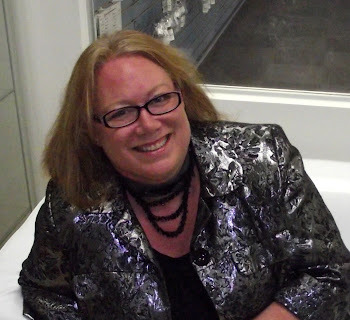 Cathy Lampole is the owner of the store and is her Goddess Bead pattern was my first foray into bead weaving. Her store is full of inspirational pieces and for many of them, there is a pattern available for sale. 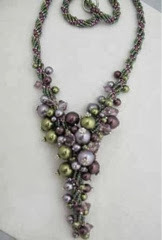 I was taken with the Trailing Pearls Necklace in mauve, burgundy and green. More often than not, I am attracted to pieces that match what I'm wearing that day. Maybe it's just a colour mood I'm in. 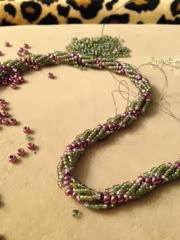 This pattern calls for seed beads, Swarovski pearls in 3 colours and Swarovski crystals in 2 colours. It's a rich and sumptuous looking necklace. I couldn't wait to get home to start on it. Love that trailing pearls necklace too!